Reality often doesn’t meet expectations when a traveler ventures to iconic destinations, but nonetheless, my mind was overcome with anticipation as I boarded the flight from Quito to Santa Cruz, where I’d be based for the next two weeks as I explored the world famous Galapagos Islands. Even though I would come with no particular itinerary, I would leave with my mind blown and enough astounding connections with the natural world to last me a lifetime. My first-day trip was to the islands of North Seymour and Mosquera, and they ended up being my favorite spots on this trip. In Mosquera, sea lion pups are left in the shallow waters as their mothers go in search of food, so it’s the ideal place to frolic with the playful creatures without the fear of being attacked by their over-protective parent. Just 500 meters away is North Seymour Island, and as I stepped off the boat, the bird calls were an immediate sensory overload. Blue-footed boobies, the birds famous for their males’ flamboyant mating dance, where everywhere. I stopped and observed the performance, which is typically a competition between two males in front of a bigger female, who watches and then, if all goes well, selects her mate for the season. Simultaneously, the frigate birds are doing their own mating rituals. The males sit on their carefully prepared nests, with their brilliant red pouches puffed up like over-stuffed, heart shaped pillows, waiting for their female counterparts to fly by and notice their beauty. Oh, how vastly does the animal kingdom differ from our own! As I watched the miraculous bird life, I saw a quick movement from the corner of my eye. It was a sizeable, golden yellow land iguana, which appeared to have crawled from the dinosaur age to the 21st century. Proof that regular travel can be a form of time travel, given the right circumstances. Snorkeling may not sound like a generic activity, and some may figure that once you’ve seen some fish, you’ve seen them all. But snorkeling in the Galapagos Islands is a completely different experience! I took a snorkeling day trip from Santa Cruz on a tiny boat through choppy waters. I was not happy about the sea sickness that I got en route. But sometimes you have to suffer to experience pure joy. Swimming with sea lions as they play a game of pass the ball using a rock was exhilarating and illustrated to me how we as humans should take lessons from nature (don’t take life too seriously and play a little!). At a different snorkeling site, I was the first in my group to jump into the water and immediately saw about 15 sharks swimming right below me. My heart jumped, and my first reaction was to get out of the water. But then I remembered that unless you are the aggressor, most wildlife won’t harm you. And so I swam after them, observing their leisurely mission. Cruising may not be for everyone, but there are few better ways to truly experience the Galapagos Islands. I booked a last minute spot on a 4-day cruise (tip for budgtravelersers who have time flexibility – you can get a major discount if you book last minute cruises directly in Santa Cruz or Quito rather than in advance from your home country). 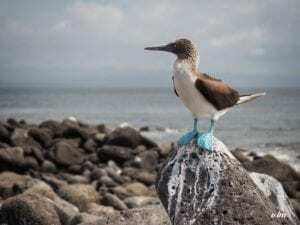 Cruise vessels in the Galapagos tend to be small, and there is a time schedule of arrivals to various islands, meaning that your boat will typically be the only one when you visit an island. Cruises go to islands where day trippers cannot go, so if you prefer a more in-depth experience and to be guided by a certified naturalist, then cruising is the way to go. They typically last 3, 4, or 7 days, and also make lots of snorkelling stops along the way. Cruises also fit every budget type, from backpacker boats with minimal comfort, to ultra-luxurious vessels on which your every whim will be entertained. I think few people realise that the Galapagos Islands, located right on the equator line, have some amazing beaches. Just an hour hike from Puerto Ayora, the capital of Santa Cruz island, is the remarkable Tortuga Bay. It’s perfectly white, sandy beach stretches for what seems like a mile. Pelicans dominate the shore, waiting to fly off to catch their meals. While the water was a little choppy, I wandered towards the opposite end of the beach, where I found a perfectly calm pool, protected from the current by a bay of rocks. 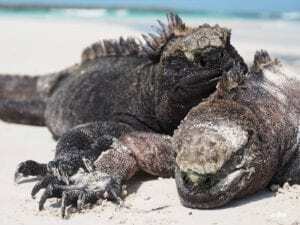 And even more thrilling was the fact that a large colony of marine iguanas lounged under the shrubs lining the beach. Once I dived into the perfectly clear, warm waters, I noticed the marine iguanas come and go from the ocean. As I did with the sea lions and sharks, I followed them along. The trek to the summit of Sierra Negra, a volcano on Isabela Island, started very early, and I was hiking in dreamlike mist for the most of the two hour hike up. The volcano last erupted in 2005, leaving a huge center that couldn’t even be photographed in its entirety on my ultra-wide lens camera (it’s the second largest volcanic caldera in the world). The memory would have to do. Later that day I wandered along salt lakes in which flamingos were feasting. This was the only place in the Galapagos where I would see the beautiful birds so up close, and made the trip from Santa Cruz worth it. 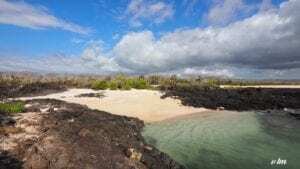 I ended up staying on Isabela Island for three days, one of which was spent snorkelling in its renowned Los Tuneles, which are lava tunnels with a plethora of sea life, including gigantic sea turtles. In Post Office Bay on Floreana Island, a tradition was started centuries ago, when whalers would leave letters to their friends and family in a post box, to wait for other sailors from their part of the world to take them back. Nowadays, travelers who leave their postcards, hoping that fellow travellers from their home country would take it back and mail it, or better yet, deliver them by hand. “Always remember nature’s lessons,” I scribbled down before depositing my postcard into the mailbox. Perhaps in a month, a year, a decade, I would receive my message to myself, and be reminded of the magical, transformational powers of travel. This entry was posted in Exotic Destinations and tagged central_america_blog, south_america_blog. Bookmark the permalink.